Independence Hall is a government building in Philadelphia and the location of the signing of the Declaration of Independence. 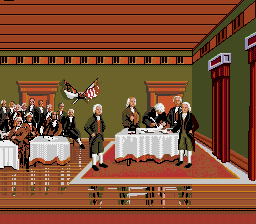 In Mario's Time Machine, the delegates of the Second Continental Congress prepare to the document on July 4, 1776 at Independence Hall when Bowser travels back in time and steals the Declaration. Mario later travels back in time to Philadelphia himself in an attempt to return the document, although he did not know the significance of the document. He can visit the Independence Hall without knowing about the Declaration and ask the delegates why they are there, prompting one of them to say that they are preparing to sign a missing document, but that they have misplaced. 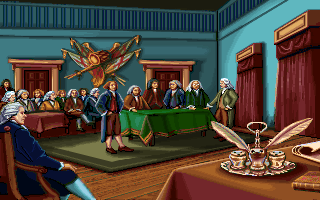 Mario can later return after discovering the document's importance; he walks in and casually asks them if they need a Declaration of Independence, and the group immediately begins signing the document, with Thomas Jefferson telling John Hancock to go first. Thomas thanks Mario for the document and his role in creating a new country, and Mario then takes his leave. This page was last edited on March 30, 2018, at 09:21.